Genome to phenome. Meaningful patterns in human diseases are often only revealed when looking at larger groups of patients. Over the last decade, we have figured out how to make genetics scalable to fit this need. High-throughput genetics can now be performed on an industrial scale with the possibility of assessing almost every base pair in the human genome in thousands of people. Phenotyping, however, has remained a non-scalable task, requiring repeated review, extraction, and interpretation of phenotypic data. In addition, there is no agreed-upon format for phenotypic data that parallels the standards we have in genetics. To overcome this problem, projects such as the Epilepsy Phenome/Genome Project (EPGP) have collected systematic, standardized phenotypic data upfront on every patient. In a recent study in Neurology that analyzed familial clustering of phenotypes within this dataset, we get a first view of what working with the epilepsy phenome may look like. We were asked to provide an editorial for this study where we emphasized that systematic phenotyping in large datasets can reveal phenotypic patterns that are beyond our understanding of disease genetics. Basically, the phenome suggests patterns that are contradictory to what we think genes would do. Phenotypic clustering in the EPGP cohort. The study by Tobochnik and collaborators examines the clustering of focal seizure characteristics in the EPGP cohort. Many phenotypic features of focal seizures are much more common in relatives of probands who have this feature compared to relatives of probands who do not have the particular feature. This suggests a genetic contribution to many phenotypic characteristics of focal epilepsies in patients with non-lesional epilepsies. Phenotypic clustering. The overall concept of the study by Tobochnik and collaborators is straightforward. The authors wanted to know whether certain aspects of the epilepsy phenotype in patients with focal epilepsies cluster. Specifically, the authors were interested in characteristics of focal seizures including focal motor symptoms such as head or eye deviation or dystonic posturing, sensory symptoms such as auditory or visual symptoms, autonomic and psychic, emotional, and cognitive symptoms. For some of these features, there is some precedent that they have a genetic underpinning such as the auditory auras in patients with LGI1-related epilepsies. For other features, however, there has been no prior data on genetic contribution. 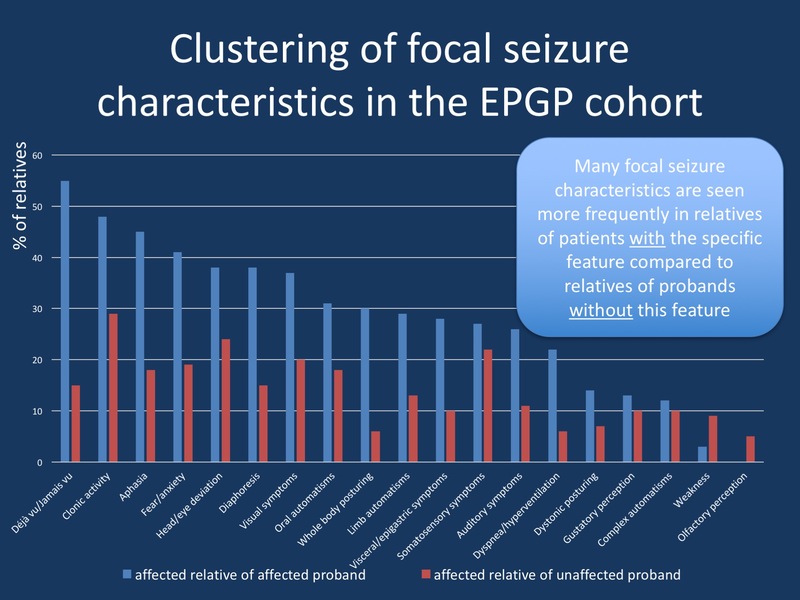 Tobochnik and collaborators addressed familial aggregation of these focal seizures symptoms in 149 families with non-acquired focal epilepsy in the EPGP cohort. This data had been collected upfront in this project, which had been the precursor to the Epi4K and Epi25 projects. Unexpected findings. In summary, the authors found much more clustering of focal features than anyone could have expected. Motor, autonomic, psychic and aphasic seizure features clustered in families. Familial aggregation was even seen in even features such as whole body posturing, diaphoresis, dyspnea, fear, and déjà vu/jamais vu. Furthermore, even type of focal seizure clustered in families, such as simple partial seizures, complex partial seizures, and secondarily generalized seizures. This dataset had initially been collected independent of the purpose of the study by Tobochnik and collaborators and the clustering was not accounted for by human bias, it was present across the board of all families. It is unusual to think that even subtle features of a seizure semiology such as dystonic posturing may have a genetic contribution, but the data by Tobochnik and collaborators speaks a clear language. This clearly suggests that expanding phenotyping beyond the classical division of focal versus generalized epilepsy may result in important findings. Phenome against genome. The dataset by Tobochnik and collaborators is not just any phenotypic dataset; it is the phenotypic counterpart to the genetic studies within Epi4K and it can be assumed that most of the 149 families were sequenced in one of the most recent Epi4K studies. However, when we try to hypothetically reconcile the findings by Tobochnik and collaborators with the genetic models that we know, we encounter a conceptual problem. Some of the clinical features identified are found in up to 40% of patients and have an unusually high odds ratio. This is incompatible with any genetic factor that we know to date. Neither rare genetic variants nor common genetic variants could easily account for this – it is too common for the high odds ratio we can see with rare variants and the odds ratio is too high for what we see with common variants. New genetic models such as polygenic risk scores may better account for this phenomenon than the genetics that we know. What you need to know. When looking at standardized phenotypic datasets, unusual features can emerge such as clustering of a large range of phenotypic features in focal epilepsies that are beyond our understanding of disease genetics. The phenome, a systematic, standardized and unbiased assessment of a large number of phenotypic features, may not easily be reconciled with what we know about genetics, which may be the launching pad to our next level of understanding the disease architecture of human epilepsies. This entry was posted in 2017, EPGP and tagged EPGP. Bookmark the permalink.